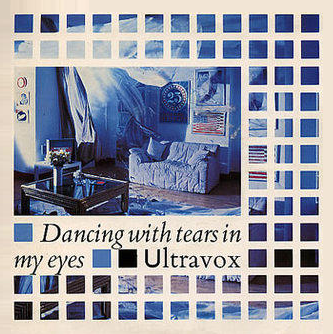 Dancing With Tears In My Eyes was Ultravox's second most successful single of the 80s (Vienna was the band's biggest hit in 1980) reaching #3 in the UK on 3rd June 1984. It was the second song to be released from the band's seventh studio album Lament, entering the UK singles chart at #29 on 13th May, while Duran Duran were at No.1 with "The Reflex". Of course, that video is just as relevant today as it was back in the 1980's and is about a possible nuclear reactor meltdown. You can see the original video further down the page. The B-side was a piano ballad entitled Building. Two other songs were released from the Lament album, One Small Day (#22) was released as the first single, and the third and final song was the title track reaching #22. Overall, Ultravox released 31 singles (17 making the Top 40, including a re-release of Vienna) and 10 studio albums. 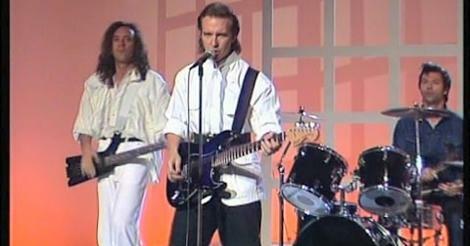 Overall, Ultravox released 31 singles (17 making the Top 40, including a re-release of Vienna) and 10 studio albums. Lament is a pretty solid album from the band, full of arty electronic landscapes, eighties sampling and tight guitar work. Midge Ure's vocals are on top form here, and this is an album full of imagination. Some might argue that some of the tracks haven't aged too well, but who really cares? Lament was released at a time when a synth revolution was taking place, and this album represents this era very well. On 25th May 2012,Ultravox released their first new studio album in 18 years. Entitled Brilliant, it received mixed reviews and was produced by the legendary producer Stephen Lipson who has worked with many other big eighties acts including Simple Minds, Annie Lennox, Pet Shop Boys and Frankie Goes To Hollywood. The lead single and title track from the album was released in April 2012 and was first played on BBC Radio 2. You can listen to a free snippet of each track from the album Brilliant at Amazon.